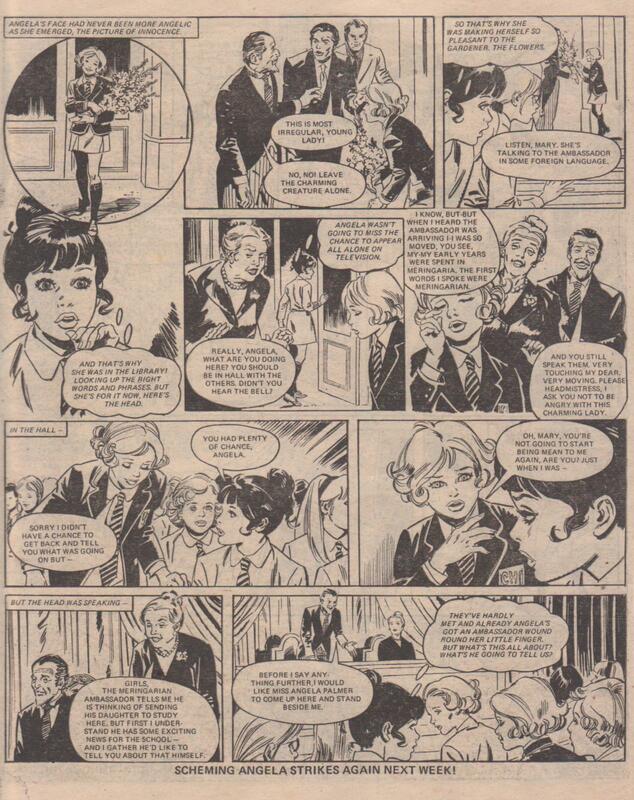 Angela Angel-Face was another short filler story which Jinty typically used over the Christmas period. It also marks the last appearance of Rodrigo Comos’ artwork in Jinty. What is noteworthy – and perhaps unsettling about this story – is that it is not Jinty at all. It is reprinted from Sandie. Angela-Angel Face used to be a regular in Sandie. The premise was that Angela Palmer, a pupil at Charleton School, is taken for a sweet-natured girl because of her angelic face. But in fact she comes from the long ‘sweet-faced schemer’ formula – a selfish schemer who uses her sweet, pretty, angelic face to take advantage of people, and lie, cheat and connive to get whatever she wants. The only people who (ever) know the truth about Angela are Mary Coates and her friend Brenda. Mary is the chief watchdog over Angela, watching out for her nasty schemes and working out how to foil them. But regardless of how her schemes turn out, Angela always gets away with it because of her angelic face and it’s on to the next story. And so Angela belongs to the formula of the ‘regular’ schemer – the schemers who are regulars in the comic. Each week (or story) they hatch yet another plot that the protagonist has to figure out and foil. The protagonist succeeds, but the schemer is never defeated for good. Next episode (or story) it is business as usual. This is how a ‘regular’ sweet-faced schemer differs from one in a serial – there, the schemer always gets exposed in the end. The plot, briefly: The Ambassador of Meringaria is thinking of sending his daughter Flavia to Charleton. Angela fools him into thinking she is a native of his country (with some phrases, flowers and the Angela Palmer charm). She wangles a trip to Meringaria for a quiz match, but is rather dismayed at the choice of girls to be on her team – guess who? And the teacher accompanying them, Miss Ryder, is not one who is so easily fooled by Angela. Mary notices a lot of strange, suspicious things happening and eventually Angela tells Mary that she is involved in a plot to kidnap Flavia. She claims she was forced and now the plotters are after her because Mary foiled the attempt. Soon after, Angela disappears, with a note saying that she has been kidnapped. Mary begins to suspect Angela was a willing participant but double-crossed the plotters, and she then faked her own kidnapping. Mary goes in search of Angela and finds her at a funfair. Angela makes claims that she was kidnapped and escaped. Mary does not believe it, but everyone else does and Angela ends up a heroine. She has got away with it (whatever it was exactly) again. Um, yes. Quite. The plot makes this serial widely regarded in Jinty discussions as one of Jinty’s low points. Readers were probably very ready to forget it as they absorbed themselves in its replacement, “Land of No Tears”, the following week. This story must have been one of the weaker ones in Angela’s run to boot. 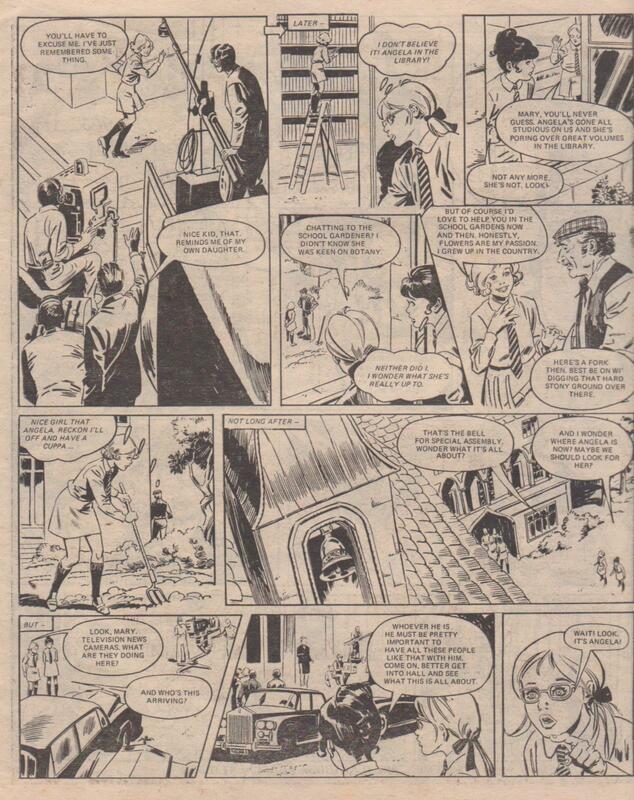 But I prefer to ponder on why Jinty would bother with a reprint from an older comic. Jinty certainly was beginning to fall on reprints at this stage. This is most notable in Gypsy Rose, where the bulk of the stories fell back on reprints. Some were Rose’s own, but most were recycling old Strange Stories. The year 1981 would see two reprints of Jinty stories. But why the reprint from an older comic? Was it a quick way to fill a spot and save money at the same time? Or could Jinty not come up with a short story of her own and fell back on a fast, cheap reprint? Or was it a symptom of a comic that was beginning to flounder? Whatever the reason, it gives you a disconcerting indication of what economics and policies were going behind Jinty at this time. Even more strange, the story was reprinted only four years later, in Tammy. Four years seems an unusually short interval between reprints. What could have been the reason for reprinting it comparatively quickly? Only just noticed – you mention ‘Carol’ in para 4 above. I assume you mean ‘Mary’?